What an amazing journey! My marriage has been restored for TWO YEARS. This all started when for the second time my husband and I were attempting to get a divorce. I was fed up and was determined to continue my walk with God with or without my husband. I was convinced that the problem was only my husband and I was the "good" wife; and I was fed up with my husband's infidelity. I tried it all, but everything failed. My attempts to "save" the marriage turned into a never-ending circle. I felt trapped and finally had lost all hope. Thank the Lord that He doesn't lose hope and He is faithful! I always prayed to God about the situation, until I finally I accepted the lie that "God had someone else better for me, (a real godly man)." One day in October our church was having a family retreat. My husband and I decided to go for our two children. Saturday night the power of the Holy Spirit moved tremendously and the Lord touched my heart to forgive my husband once again. I thought it was crazy and impossible, but I knew I had to be obedient! I fell on my knees exhausted, tired, and weak; and I prayed that I needed Jesus to strengthen me. I laid it all down to Him; what I wanted in a man, husband, and father for our children. That same night, a woman came to me and handed me her phone number. She said that she really wanted to talk to me! I called her and we met that same week. 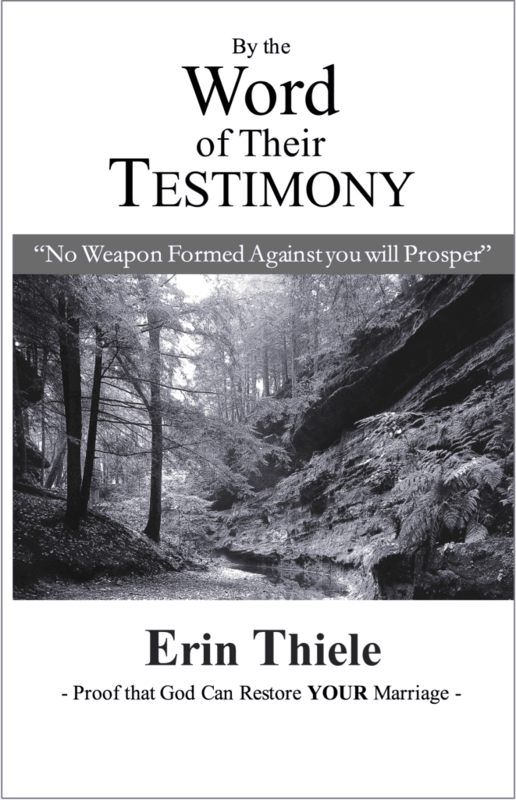 She introduced me to Restore Ministries and gave me a copy of Erin's book. She was praying with another sister in Christ on the phone for their marriages and I decided to join them! I praise the Lord for Erin and her ministry. The book was a complete eye opener. The way the Lord revealed Himself to me was amazing! I cried so much when I realized my faults and errors. God is so merciful that through the pain, I was set free! I surrendered myself completely to Him. He changed me, molded me, and made me new. Through forgiveness He gave me a new love for my husband and I was blinded to any of my husband's faults. I now love, honor, and submit to my husband as to the Lord. I truly believe that what I went through was God getting my attention to trust solely in Him! When we try to fix things, the change is temporary. We need to let go and let God! Run to Him only in all things; He is the head of all men!! Through all my changes, the battle had just begun. The hard part was about to come, but "greater is He that is in us, than he that is in the world." My faith was tested and I was determined to go THROUGH the fire, not stay in it! My husband once again was with an OW. He had never openly done so and he involved the children which was very hard. He never left the home although he said he would! I took the scriptures and was obedient to the word. God amazingly gave me the strength to see the situation as what it was: temporary, not permanent! When my husband was away, I took it as time to get closer to my Lord. I fell deeper and deeper in love with Him. He became my “everything” and nothing could take my joy away, no circumstance or situation! It was not an easy journey! I prayed constantly, fasted, and declared scripture with God's promises. My attitudes, thoughts, and actions all reflected on God's Promises. My faith and belief did not come from what I saw, but from what God had for me. Every scripture with every word written in Erin's book became my lifestyle. I learned so much! The more I let go, the more I saw the miracles and changes. I was no longer the one trying with my flesh; I now put my trust in God's Holy Spirit. I knew the changes He made were permanent! As the scripture says, the adulteress woman is sweet as honey, but then becomes bitter as wormwood. God's word never fails! By January, my husband broke it off with the OW. He asked for forgiveness and was amazed how I continued to love him no matter what! I think for the first time we experienced unconditional love for each other. I give all the glory to Jesus! We had a wonderful anniversary in February. Since our restoration, I continue to keep strong in my walk with the Lord. I wouldn't have it any other way! As I trust in God for everything, my husband is our provider, spiritual leader, and a Godly man! We now have a strong marriage standing on the Rock! I have so many testimonies that I try to share as much as I can with other women who feel no hope. I must say to all of you: "GOD CAN AND WILL RESTORE YOUR MARRIAGE! NOTHING is impossible with God!" Looking back, it all began when I was attending a family retreat with my husband and children. I had already attained a lawyer for our divorce and was there for the "children". My husband had been unfaithful various times and I had had enough. At that point there was no more tears, because I deserved better. The Saturday night of the retreat my daughter, 11 at the time, went to the altar and started crying. I went up a bit after to support her. She looked at me and said "please don't leave me". So I got the book and started reading it. I just remember praying for God to open my heart to Him. I had heard everyone else's advice, but I wanted Him to speak to me. I was in shock as the Word of God became so real and bold. I felt like the veil was removed from my eyes and I could see clearly all my faults and What God's purpose was for me. He gave me a new heart and a new love for Him. He healed me and all my hurts and the ability to see my husband with His eyes. The old me would have flipped, but God just gave me this calmness and peace so I just listened and accepted. My husband couldn't believe it and had to make sure I was listening and understood. I told him I did and he left. He never physically left the house, but I let him go and never looked for him or called. God became my everything. EVERY tear, concern, feeling, and need I gave it to God. I didn't speak much only when necessary and never asked questions, it was no longer my problem but God's. He sustains me and I wanted all the glory to be His. There was sooo many tests but I always saw them as just that, tests. In the beginning I was praying and always seeking Him. I was not used to doing this so I didn't “feel” much. I was persistent and pressed forward because He was all I had. The more I ran to Him the more I would see Him move and I truly fell in love with Him. I was praying one night, like I had been doing for quite some time and I was declaring the scriptures I had written down on cards. All of a sudden I felt this boldness come over me and the POWER of His word really touched me. It was like my spiritual self was no longer a baby but had grown. That was when I felt His word come alive, IF GOD IS WITH ME WHO CAN BE AGAINST ME. All fear was gone and my trust was and is completely in Him. I didn't have to worry about the future or what was to come, I have the Lord and He is all I need and want. There are many principles the Lord taught me, one is to Love. If God lives in us and He is love how can we not do the same and have compassion of others. Forgiveness is very important. God showed me all my faults and He is so merciful to forgive me how can I not do the same to others. It sets you free so God can move. Love never fails. We are His instrument to show unconditional love to others. That may be the only time they will see a glimpse of God. For me the RYM book was the most important RMI resource since it was some time after my restoration that I even visited the website. I want to encourage you dear friend, you are where God wants you to be. You may not understand and want to run far away, but God wants you to be still. Give him your heart and you will never be the same. Always praise God. When the trials get tough your blessing is close. Let God be your provider and turn to Him for everything. Being restored for 10 years has not been easy, but God is so faithful. Stay true to your faith and obedience to God. His word is always truth and clear. Don't complicate it with the details and circumstances of your life. OBEY His word and LOVE him more than anything and anyone. You were called with a purpose, to do not as the world does, but to live for Him. He is worth every tear, sacrifice and humiliation. He deserves everything and more. When you choose to love, forgive and obey the enemy will flee! ~ Lota in Miami, Florida, is our Spanish Restored Marriage Minister who has been used by God to work closely with RMI’s Spanish Español ministry since her marriage was restored over a decade ago in 2002. **Ministry Note: What you have just read is Lota's FULL Restored Marriage Testimony. It may seem familiar to you if you've already participated in our Online Courses for Women, due to her partial testimony being shared in Course 2; however, we felt it was important to share her RMT in it's entirety for you, our eReaders, and for the added blessing!! CLICK HERE to get your own copy to mark and read how others, like you, made it through their Restoration Journey and experienced a RESTORED MARRIAGE.